So here’s the thing: I suffer from occasional vertigo. Sometimes I’ll be driving along the highway, and with no warning my body will inform me that the car I’m driving is upside down. Or I will become suddenly convinced that when I crest a hill, my car will flip backwards, end over end. My logical brain knows that these sensations are not real and are simply the result of some horrible combination of chemicals in my brain. But in the moment, with my body screaming at me of imminent danger, panic sets in regardless of my consciously knowing that everything is fine. Often, I am able bear down and get through the moment, but there have been times that I have been forced to pull of the highway and sit in a parking lot for a while to regain my senses. The point? I might not be the best guy to be reviewing Detached. Detached, to me, is the most terrifying horror game I’ve ever played. To other folks, it’s probably thought of as “that chill spacewalk game”. But with its focus on spacewalking and zero gravity maneuvers, Detached gave me nightmares. It took me almost a month to work through the 5-6 hour campaign (which may have taken normal folks 3-4 hours. My gameplay time is significantly padded by “cowering”). 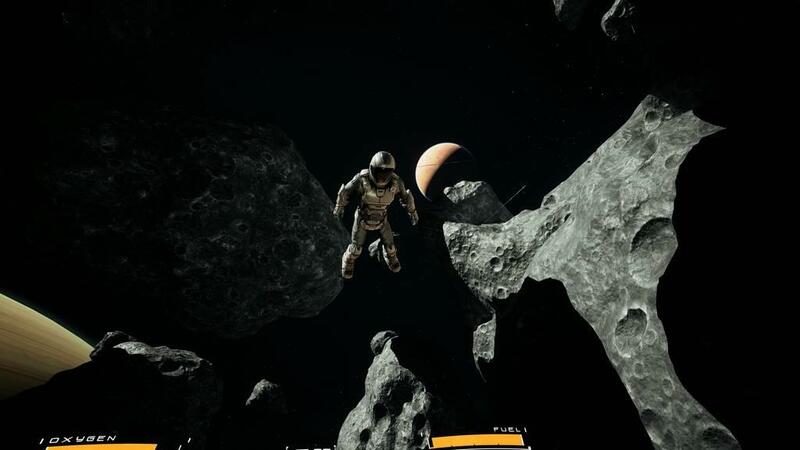 In Detached’s single player campaign, players slide into the spacesuit of a deep-space salvager. 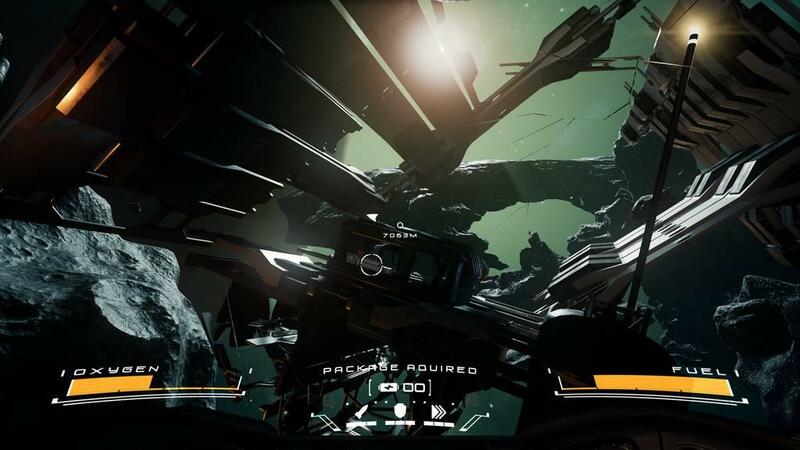 While plundering a long-destroyed space station, the player and their partner are attacked by space pirates and are left without a viable ship. The space station, which is floating in scattered chunks across an asteroid field, suddenly ceases to be a payday and becomes instead “the only way to survive”. 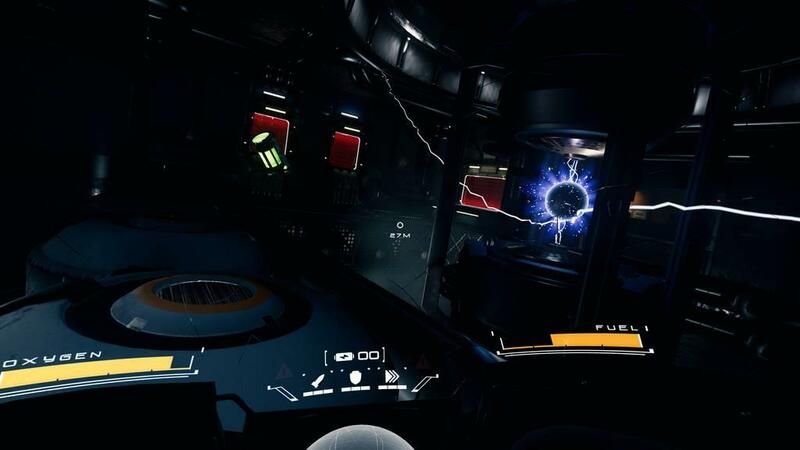 Players must leave the safety of their disabled ship and take to open space in an attempt to reengage various systems on the destroyed space station, eventually enabling some escape shuttles and saving themselves. This all begins with a moment that is one of the greatest VR experiences I’ve had. The instant that you leave your ship and find yourself floating in open space with no tether to keep you from floating away into the murky abyss is one of the most glorious moments I’ve had in VR. You are “detached”, in the literal sense of the word, and you must immediately start making your way to the closest space station hunk, picking up air and fuel along the way. This moment is awe-inspiring in its vastness, and to me, brain-meltingly petrifying. In your rather advanced spacesuit, you are not left to drift aimlessly. Players are able to control thrust in a number of directions (up, down, forward, back, left, right, and for the love of God, rotate), and can counter their forward momentum with a tap of a button to come to a stop. The controls, which are taught to the player in a nifty enclosed-area tutorial, reminded me a bit of those in StarBlood Arena, another game that toyed with my emotional need for gravity. Like Starblood, my vertigo was singing angry war-songs the entire time I played, but I never got even a hint of VR nausea. Detached has several anti-nausea techniques in place, including a dynamic that lowers player’s field of view to a pinpoint while turning. The faster you turn, the smaller your field of view. It worked great, and was therefore fine with me. I had enough to worry about without fearing losing my lunch. Detached has several “realism” settings, ranging from “Arcade” to “Simulation”. These setting are aimed at allowing players some control over how realistically the physics behave in the game. 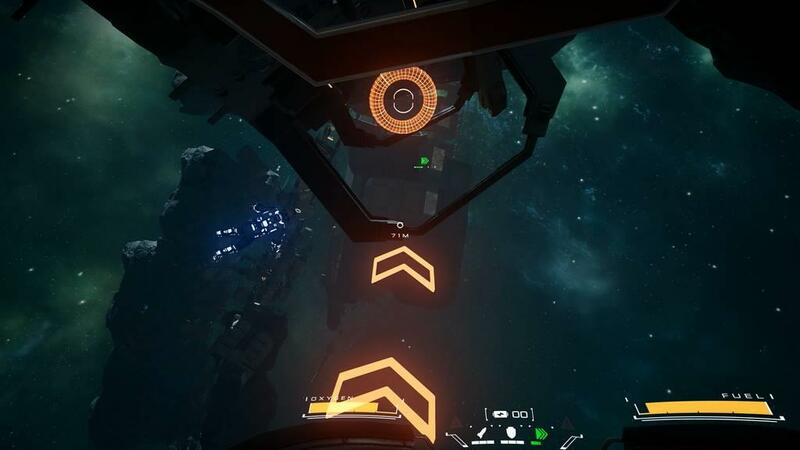 In Arcade mode, players’ bodies are less reactive to outside forces, whereas in Simulation, getting tapped by a floating object will send players spinning off into the abyss until they can reestablish control. I don’t think that it will surprise anyone that I stayed locked firmly in “Arcade” mode. Various space station modules are scattered about the sprawling asteroid field, with each module acting as a “level” of sorts. Players are left to their own devices to determine where to go next, which could result in frustration for some. Modules are very distant, and moving between them can take several minutes. Players are given very little indication as to where to go next, so I spent a lot of time drifting around looking for markings or writing on the various space station chunks. After a bit of time adjusting to the existential terror of space, I found this portion of the game to be soothing. While some might find floating around in space to be a bit boring, I quickly established “up” and “down” in my mind, which allowed me to happily putter around in the asteroid field. It quickly became my favorite part of the game. Once you gain entry into each module/level, you will be faced with progressively more difficult challenges to get the power back on. There are usually objects to find, light puzzles to solve, and timed obstacles (get through the door before time runs out, avoid the beam of propulsive energy that is about to burst forth, that sort of thing). The entire time, you have to keep an eye on your oxygen and fuel, though in Arcade mode this is more of a maintenance thing than an impending crisis. As the game goes on, new wrinkles are added to the gameplay. The spacesuit gains more abilities (including missiles, which are of course, a spacesuit mainstay). Obstacles become more difficult, turret-like sentinels are added to the mix, time limits become tighter. All of this would have been totally fine, even boilerplate, if it weren’t for my constant struggle to maintain some sort of grip on the environment. Every level/module is designed in a way that has the player actively shifting their perspective on what is up and what is down. Drifting down a corridor, you will see that the writing that is painted on the wall is upside-down. That is intended as an indication to the player that it is time to rotate, because the ceiling has suddenly become the floor. Or the walls have become the ceiling. Or the floor has become the wall. Or you are trapped in an unthinkable hell, and you will never escape. Obviously, the method of propulsion and maneuvering gave me more trouble than it will give the average player. And while I found the entire game to be utterly unnerving, I can see a well-adjusted player still occasionally becoming disoriented. Humans just aren’t built to exist in a gravity-free environment, and there is a reason that NASA is so choosy about who gets sent to space. It takes a special kind of person to be able to completely disregard their sense of orientation, so don’t be surprised if you start to feel a little vertigo-ish yourself. Detached works great as a simulation, but as a game it leaves a bit to be desired. My main grievance is with the checkpoint system, which is a tad unforgiving. If you are working your way through a module and you unexpectedly get killed (it happens), you are forced back to the beginning to start over again. If you are like me, and you have baby-stepped through the entire thing, this feels like a slap in the face. And while some players may appreciate the free-form exploration, I personally would have enjoyed a bit more hand-holding. Yeah, I’m not ashamed to say it. I’m floating in space. Point me in the right direction, dang it! I believe (I’m not 100% on this) that Detached started as a multi-player experience on PC, with the single-player campaign added over the couple of years since the game’s original release. The multi-player stuff is included in the PS VR release, and I gamely queued up to allow some strangers to destroy me as I metaphorically crawled on hands and knees around the course. Unfortunately, I was never able to find an opponent. The game does allow players to fire up multiplayer gameplay and run through it solo, but given my predilection towards freaking out, I didn’t find this mode terribly appealing. I tried it a few times and quickly moved on. The visuals are beautiful and awe-inspiring, particularly the parts that have players floating freely in space. Not many folks are playing the multiplayer, which is a shame. Plan to play with friends if you want to take advantage of this portion of the game. The actual level design is unique, but might be disorienting. Puzzles and obstacles are less inspired, but are serviceable. Checkpoints are a bummer. Some additional help finding the next destination would have been welcome. Anti-nausea tactics are well employed and very effective. I would expect that players’ reactions to Detached will vary wildly, depending on their stomach for the sort of disorienting gameplay that is its mainstay. 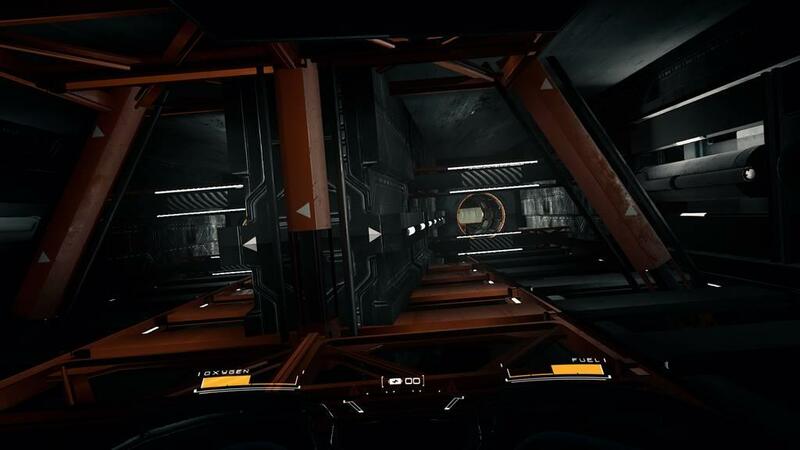 Detached absolutely nails the feeling of zero-gravity space walking, so if that appeals to you, you might want to check it out. Just don’t expect to see me there. I’m on my back in a dark room, fingers clutching the carpet, cursing the very idea of floating in space. Detached is a great spacewalking simulator, with gameplay that has obviously been built up around that mechanic. While some of the more “gamey” elements might not be up to snuff, you can’t argue with the feeling you get when you leave a ship and are floating freely in space. Expect to be mildly frustrated with the lack of direction and irritating checkpoints. But also expect to be awestruck by the superb visuals and setting. Detached is a mixed bag, but the spacewalks alone are worth the price of admission.